Why the H would i do that ? Hahaha ! Is it the 1st of April ? I Don't even wanna Upgrade. Never mind make it "Look Like". Yup.... I'm still Using a Tailor made XP system...... WHY..?? Using Win7 x64. Then I did a bit of Research, & heard "True or Not". all the 3D & Effects. 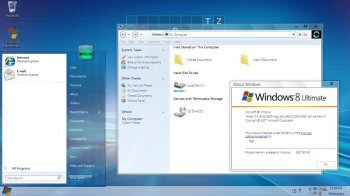 A basic Windows System which will be a Workhorse. Razz-Matazz.... Get a grip @Microsoft...... Grrrrrrrrrrrrrrrrrr..!! For me and many other no touchscreen hardware users Windows 7 is much better than Windows 8. And if you have got a touchscreen the best you can do is to install Windows 8.1 instead. ONE star (too high a rating but that's the minimum allowed). they fixed it... version 6 works great ! Just for fun, tried this on a virtual installation of XP. Wow. Long story short, made the newly patched OS unbootable. No big loss, but would be wary of this transformation pack. Do they also have a transformation pack for Windows 8? I prefer the look and feel of Windows 7.
has any one tried the windows 8 beta ? "Horrid" Might as well have a win98 ME transformation pack ! All it did was screw up my laptop.